This post is brought to you by Shopetti and as always my opinions remain completely my own! I just heard about a new site and I think it is fabulous. It’s called Shopetti. It was created by a mom, like myself who buys a lot online from several different stores and thinks that there has to be a quicker way to shop. Unlike myself who just thinks about the idea, she actually put feet behind the idea. She created this site where you can shop from multiple stores all from one site and check out with one basket. Genius, right? No more clicking and clicking around. This is all in one place. Are you as excited as me about this? I was playing around today and I was checking out items from The Children’s Place, Toys R Us, Victoria’s Secret, and Pottery Barn. You can go shopping by browsing their featured items, by searching by brand, or by store. You can even sign in via your Facebook or Google account and it will save your shopping cart for you and you’ll be automatically notified when new sales go live on your favorite stores. How cool is that? There’s even a Chrome toolbar extension to make your online shopping even easier! You can check out how Shopetti works by watching the YouTube video below but then be sure to enter to win a $125 shopping spree below! Good luck and happy shopping! Don’t forget to enter this giveaway! Just think of all the fun things you could buy for $125! Fourteen lucky winners will each receive a Julep nail polish in the shade Evie. Approximate retail value is $14 each. One winner will be chosen each day until this giveaway ends. Julep nail polish offers sophisticated, classic colors to beautifully compliment any look as well as bright and fun colors to liven up any outfit. Its long-lasting formula provides days of chip-resistant wear. Julep is a 4-Free polish meaning that it doesn’t include 4 nasty toxins that some other brands do. Julep is toluene-, phthalate- and formaldehyde, and formaldehyde resin free. If you haven’t tried Julep polishes before now is a great time to do so! Plus, if you love nail polishes as much as I do you might want to consider their Maven program where you pay a small fee and have polishes shipped to you monthly. I’m a big fan! 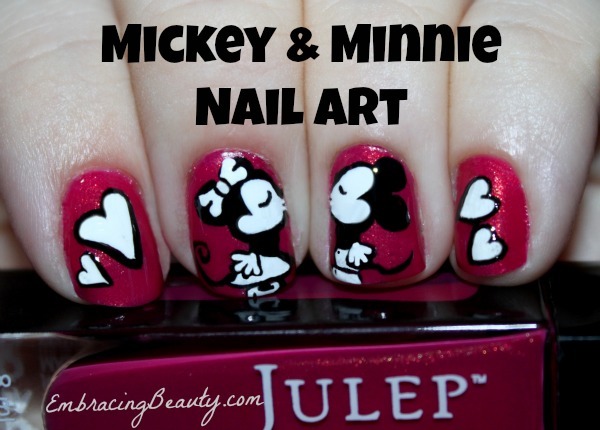 The color Evie was featured in my Mickey and Minnie Nail Art that I featured a few months back. The color is a tad lighter than the picture portrays it. It’s much lovelier in person, trust me. Here is a picture that Julep just put up on their website and I think it portrays the color much better. You can purchase the color Evie by going to Julep.com. Yay! I’m so excited to see my nail polish for sale online. Go buy it…then enter our giveaway which is ending very soon! We’ll have the same Rafflecopter form throughout the giveaway and I’ll choose a winner each day and announce the winner below. Winners 6-14 have yet to be determined. Enter below to win. Good luck! 3. Submit your video, share it with your friends and family, and ask them to VOTE For Your Child!! Hurry, you only have until July 8th to submit your videos! If you submit your video come back here and share the link with us so we can help vote for your child. 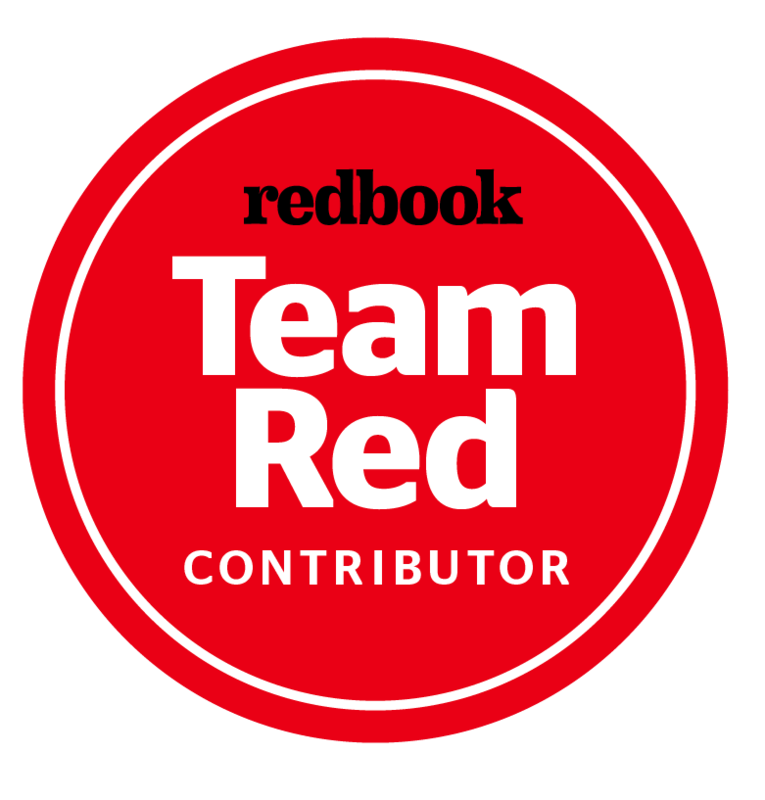 Contest judges will be selecting the top videos every week which will be posted to the company Facebook page. Nominees are given easy tools to “share” their videos with their friends and family to help increase their vote totals and check their progress in the standings. Videos can be submitted to Desire2Learn’s Facebook page until July 8, 2013 then friends and family can vote on the videos they like until July 22, 2013. The contest winner will be announced via press release on July 29, 2013. This post was brought to you by Desire2Learn. 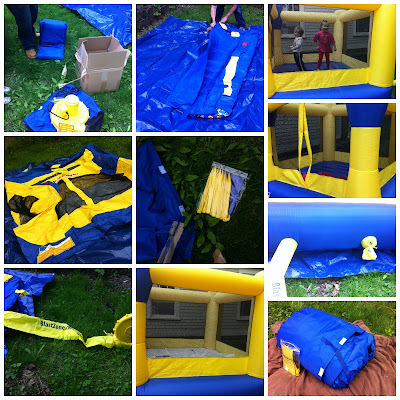 “BLAST ZONE” is American company and their bounce houses have every feature you could ever want! Plus, the colors are bright and vibrant! *Disclosure: So Sew Mama and Embracing Beauty are not responsible for sponsor prize fulfillment. I was not compensated for this post. So Sew Mama received a sample to try with her family. All opinions are 100% her own. Facebook, twitter, and Pinterest are not affiliated with this giveaway and are released of any obligations. Would someone consider me “green?” I don’t know. Maybe. I’m not green for the sake of being green or because it’s trendy. I actually despise the trendiness of it. I’m mostly green because I’m frugal. Plus, since having a baby I’m ever aware of BPA, parabens, and formaldehyde in everyday products. Founded by two parents, their mission is to give families the ability to research, get advice, and buy high quality, natural, non-toxic everyday products all in one place. From kitchenware to skin care, MightyNest‘s safety experts have built the web’s broadest selection of products that are free from known toxic ingredients such as BPA, PVC, Phthalates, Lead, Melamine, Formaldehyde, Parabens, and more. 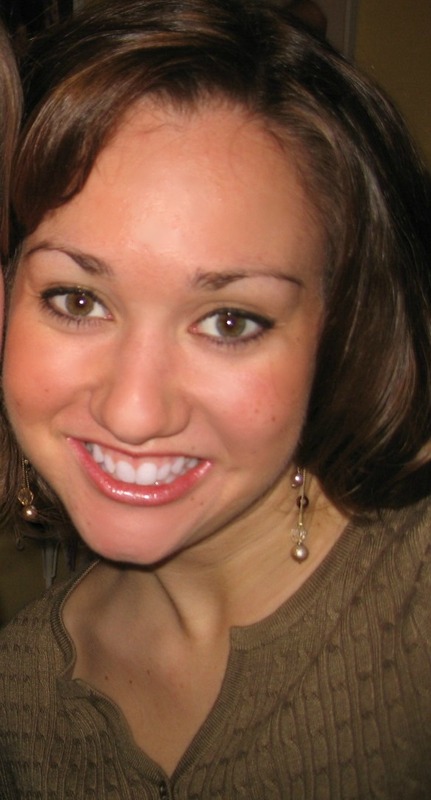 MightyNest seeks to help people feel motivated and empowered to make changes in their lives, whether large or small. Since my little one was born I’ve been working on replacing old pans that are chipping. We’ve replaced our old grill where the top of the lid was chipping off and falling in our food. We’ve also replaced old, old melted plastic containers that were full of nasty toxins. I’m a sentimental person so it wasn’t always easy getting rid of things that were passed down to me from my family or my husband’s family. Brand new shiny things helped to ease the separation pain but because of the cost I’m only replacing a little at a time. I found a giveaway to help me replace more items at a quick rate! 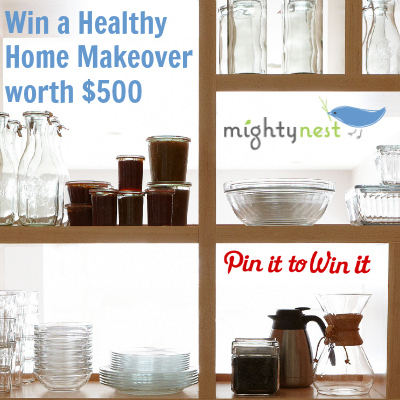 MightyNest is giving away $500 through their Healthy Home Makeover Pin it to win it Challenge. I’ve started pinning to win already and you can too! The giveaway is pretty simple really. You just repin your favorite items from MightyNest’s “Healthy Home Makeover” board onto your own Healthy Home Makeover board. There are things for every room in the house and even a good amount of cute baby toys. Trust me, once you start pinning it will be hard to stop. That’s it though! Just pin and you’re in. For more information go here and check the rules on the specifics. Here are the other ways you can connect with MightyNest! Enter the MightyNest $500 Healthy Home Makeover Giveaway! Disclosure: A gift card is being provided by MightyNest for my time in sharing this giveaway. All opinions are my own. Welcome to our Vinyl Decal Giveaway! 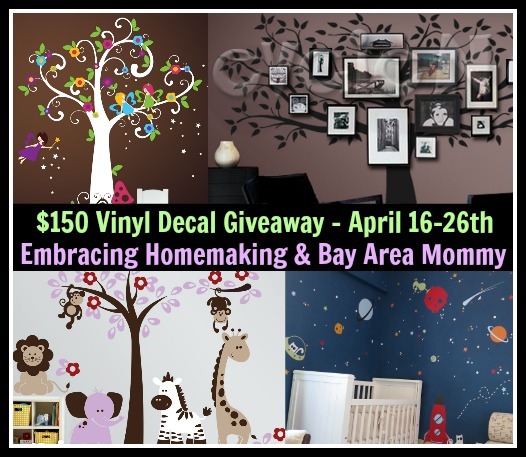 This giveaway is hosted by Embracing Homemaking and Bay Area Mommy. 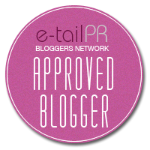 Special thanks to Evgie.com for sponsoring this giveaway and to our co-hosts. Vinyl decals are a great way to change the look of a room. They’re inexpensive, they’re easy to apply and remove, and they add just a touch of whimsy to your walls. You can buy all of these decals seen here (and many more!) on Evgie.com. $150 Gift Certificate to put towards ANY purchase at Evgie.com. 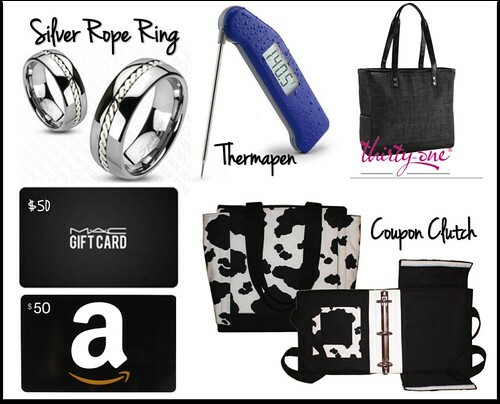 One lucky reader will win this $150 gift card but you can’t win if you don’t enter! This giveaway will run from April 16 at 12am EST through April 26 at 11:59pm EST. Open to US & CA residents 18 years and older only. Void where prohibited. No purchase necessary. To enter, simply use the Rafflecopter form below. Good luck! Disclaimer: No compensation was received for this post. This blog is not responsible for prize fulfillment. For questions regarding this giveaway, please feel free to contact Ashley from Embracing Homemaking at MrsAshleyWalkup@gmail.com. Welcome to our Pre-Mother’s Day Giveaway! 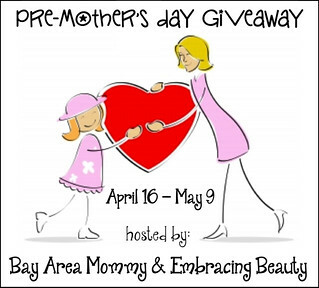 This giveaway is sponsored and hosted by Embracing Beauty and Bay Area Mommy. 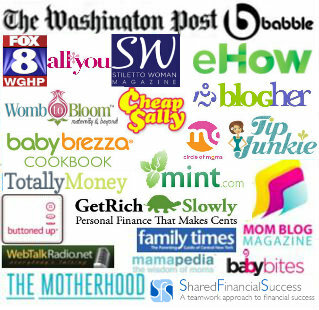 Special thanks to Buy Blue Steel, Thermapen and 31 Gifts for providing some of our prizes, and to our co-hosts I’m a full-time mummy, Finger Click Saver, and Rocky Mountain Savings! 1 Thermapen ($90) – You can read my Thermapen review here. One lucky winner will win ALL these prizes! This giveaway runs from April 16 at 12am EST through May 9 at 11:59pm EST. Open to US residents only. Void where prohibited. Must be at least 18 years old to be eligible. No purchase necessary. To enter, simply use the GiveawayTools widget below. Good luck! $100 in Swagbucks Giveaway Ends 4/20/13 + 100 SB for New Members! 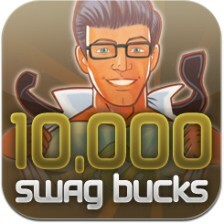 I’m excited to be partnering with Swagbucks to give away a $100 in Swagbucks (10,000 Swagbucks to be precise)! We’ll be giving these codes away to three lucky winners after the giveaway closes on Saturday, April 20, 2013 at 1pm EST. Shore Savings with Patti, Family Centsability, and Coupon Crazy & Freebie Fanatic are helping me promote this giveaway and drum up extra excitement over it so stop by their sites and say hi! Anyone new to Swagbucks can use my exclusive sign-up code BEAUTY70 will get an extra 70 Swagbucks in addition to the 30 they’ll get for just completing their profile. That’s 100 free Swagbucks to start you out on the right foot! A $5 Amazon gift card is only 450 Swagbucks! This code expires on April 20, 2013 at 11:59 pm PST so sign up now and start turning your searches into free gift cards. You can only enter this giveaway once per person but there are certain entries you can do daily – such as tweet about the giveaway! To read more information on Swagbucks check out my Get Paid to Search post. Ready to sign up now? Go here to Swagbucks to sign up and click on the text that says “I have a sign up code,” enter your code BEAUTY70, complete your profile, and voila, you are on your way to earning free gift cards! I’m excited about giving away Swagbucks because I like that the winners can choose what they do with their Swagbucks. If you win you could play games, Swagstakes, take advantage of Swagbuck’s Local Deals, or buy a gift card in the Rewards Store. If it were my I would probably buy Amazon gift cards! What will you do with your Swagbucks if you win? Enter via the Rafflecopter form below and feel free to contact me if you have any questions. This giveaway is open to anyone 18 years and older. You must be a Swagbucks member to enter but not necessarily a new Swagbucks member! Good luck and check back for the winner’s announcement next Sunday! Enter to win a free $500 Whole Foods Market gift card! 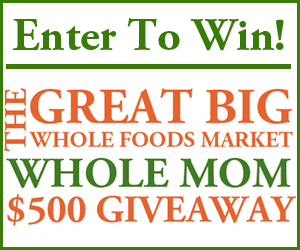 Enter to win a $500 Whole Foods Market Gift Card Giveaway from Whole Mom!